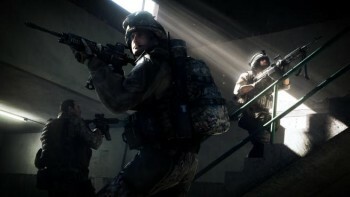 DICE announces Battlefield 3 multiplayer will be shown at E3, but that's far from being its biggest surprise. A recent entry on the official Battlefield blog, announced Battlefield 3 will feature an "extensive co-op campaign" - a first for the series. The game will also implement a social network and stat tracking portal with the new Battlelog website, which will be free to all players. "[Battlelog] lets you manage your friends lists, squad up, create platoons, use voice chat and follow your friends' progress in real-time, and more," DICE general manager Karl Magnus Troedsson wrote. It was also announced the game would feature Team Deathmatch, which is kind of like announcing the game will feature sound options, at this point. More so than any entry before it, Battlefield 3 seems like a direct reaction to Call of Duty. In past entries, single-player was always secondary. Now, it's the first thing shown off in trailers. With the announcement of community features and co-op, it seems BF3 is a note-for-note response to Actvision's best-selling military shooter. Add on better graphics for all and the fact that Activision want people to pay for many of the features DICE will offer for free, and Battlefield might have a shot at taking CoD's throne. Co-op and Battlelog will not be shown at E3, but readers can look forward to our coverage of multiplayer (on the new "Operation MÃ©tro" map) next week.